One of the biggest misconceptions about hail damage to a roof is that if it isn’t obvious from the ground, there is minimal destruction. However, savvy homeowners understand that the best way to determine if they need to submit a hail damage roof insurance claim is to have a reputable contractor inspect all aspects of their property. In James’ case, the roof appeared to be in decent shape when standing on the ground. However, we climbed up on his roof to complete an inspection and we were greeted with a countless hail indentations. His gutters had fared no better. Our team had completed a residential metal roofing project at James’ last home in Roseville, MN and he’d appreciated its capacity to withstand hail damage. While he wasn’t interested in a metal roof for his new home, he did want our feedback on impact-resistant GAF roofing. He also wanted to upgrade his current gutters to a maintenance-free option. Here’s how the roof looked when we inspected it. 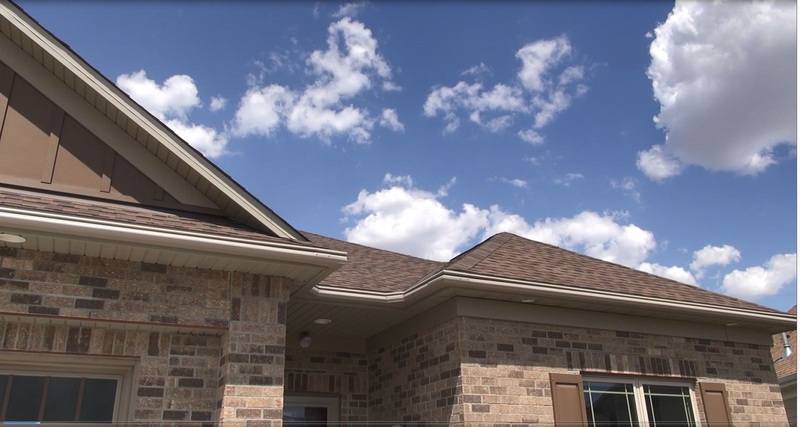 Roofing: When we learned that one of James’ top priorities was installing an asphalt roof that could better withstand the impact of hail, we suggested the installation of GAF Armor Shield II shingles. They pass the UL 2218 Class 4 Impact-Resistance Test, making them eligible for discounts with some insurance companies. In order to pass this test, shingles must be absent of lacerations and fractures on the front and back after having a 2” steel ball dropped on them from a height of 20’. Class 4 is the best possible rating. GAF Armor Shield II shingles are able to achieve this distinction because of their patented composition that has a rubber-like consistency. The shingles are crafted to give the appearance of a wood shake look, enhancing a home’s curb appeal. James opted for shingles in Barkwood. This color was the perfect complement to the home’s siding and shutters. Gutters: When you’ve just installed a roof with a 50-year, non-prorated warranty on labor and materials, the last thing you want to do is speed up its lifespan with shoddy gutters. Undersized gutters can cause water back up on a roof. If this happens over an extended period of time, mold can grow, fascia rot can occur, and the roof’s overall structure can become compromised. For this reason, James opted to have our team install LeafGuard® Brand Gutters. Not only have they earned the Good Housekeeping Seal, but they’re the only patented one-piece, seamless gutter system guaranteed never to clog. In the event they ever do, it will be our team with safety equipment addressing the situation free of charge. "Lindus built a wonderful deck for us. The workers were friendly yet very professional. They took down the old deck, hauled it off, repaired some house damage due to poor installation by the previous builder, took care of all the necessary paperwork with the city, built a beautiful deck , and cleaned up immaculately every day! As I write this, I am watching them re-side the house next to mine and they are being as meticulous with that job as they were with mine!" - Joy B. "Sales discussed several options. Work was performed timely manner. No pressure. I would definitely recommend Lindus." - Gregory G.